Thinking of buying a home, but unsure of where to start or how the process works? Buying a home has several moving parts from choosing a realtor and lender to learning about the home inspection and appraisal process. Join Realtor Andrew Broll, The Broll Team, and Loan Officer, Dale Gross, Fairway Independent Mortgage Corp., to alleviate the anxieties of buying a home. We'll lay out the home buying process to help you make sound real estate decisions. A lot of the information you may hear about buying a home may be inaccurate or misleading. We'll help you cut through the noise! 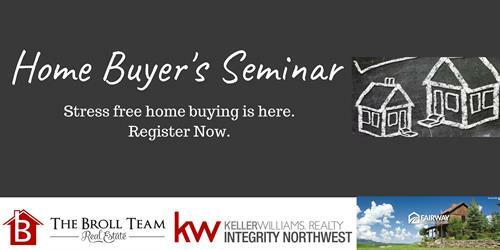 Join us at the Keller Williams Integrity Northwest Real Estate office for a FREE Buyer Seminar! Subs and chips will be provided. Monday, February 18th 6:00 p.m.-7:30 p.m.